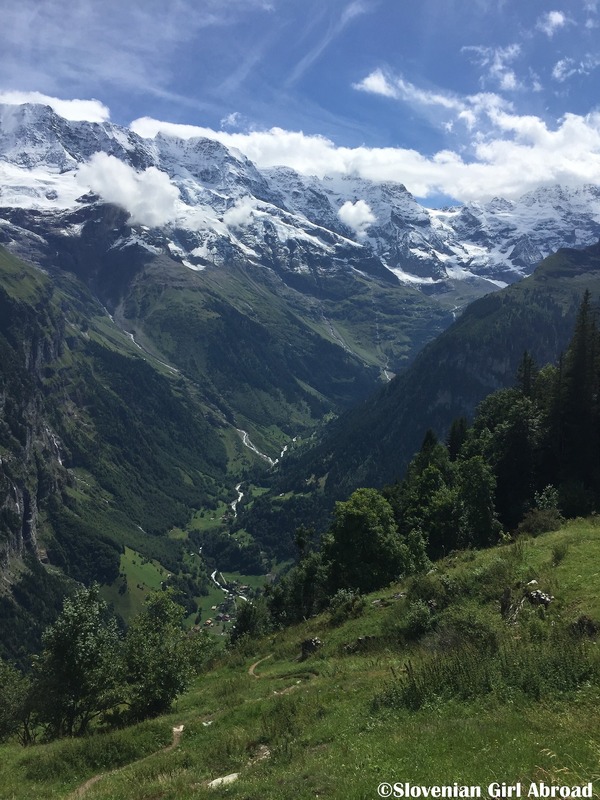 Our trip began with the scenic drive to the Lauterbrunnen Valley via Brünig Pass, a 1,008m high pass connecting central Switzerland with the Berner Oberland. On our way, we’ve made a quick stop at the viewing point overlooking the Lake Lungern (Lungerersee). After few obligatory pictures of this beautiful lake, we’ve jumped back into car and drove to Stechelberg. We parked our car, bought our tickets and boarded first of many aerial lifts we’ve rode that day. After quick ascent in two rather packed cable cars, we’ve reached Mürren, idyllic alpine village located on the side of a cliff high above Lauterbrunnen valley at the altitude of 1,638 m. We’ve strolled through the village, admiring the gorgeous scenery. The views to the mountain peaks and glaciers were breathtaking. Because the webcams at Mürren cable car station showed Schilthorn was covered with thick layer of clouds, we decided to go for a lunch before ascending to the summit. We hoped by the time we would filled our bellies, the sky would gradually clear and allowed us to witness the breathtaking scenery. As it turned out, that didn’t happen. After having delicious rösti at one of the Mürren’s restaurants, we’ve continued with our ascent to Schilthorn. We took the cable car to the mid-station Birg at the 2,677 m altitude where we’ve faced our fear of heights at two of its attractions: a observation deck over the vertical abyss called Skyline Walk and Thrill Walk, a cliff path with sections with glass-bottomed floor, rope bridge and a tunnel. While the male part of our group conquered most of those sections, we ladies rather just observed them. After the adrenaline filled walk, we caught the cable car to Schilthorn. Unfortunately, the sky did not clear out. We’ve received few rays of sunshine from high above, but where we should see the panorama of the magnificent Alps, all we could see was the infinitive white fog. Schilthorn is not only place where you can admire panoramic views of the Alps, but it is also famous for being the principal filming location of one of the movies from the James Bond franchise. On Her Majesty’s Secret Service was filmed here in 1960s and the legacy of 007 is still very much present. The whole floor of the building is turned into exhibition dedicated to the James Bond move. Bond World, as the exhibition is called, introduces you to the On Her Majesty’s Secret Service movie and 007 franchise through the different panels, videos and games – interactive rides that made you feel like you’re the famous agent. When you’re having fun, time flies and too soon it was time to leave. Descent back to the Stechelberg was much quicker than the ascent. In half an hour we were back in the valley. We’ve paid parking fee and were ready to return back home to Lucerne. But, almost as soon as we left the Stechelberg, we fell into the massive traffic jam. 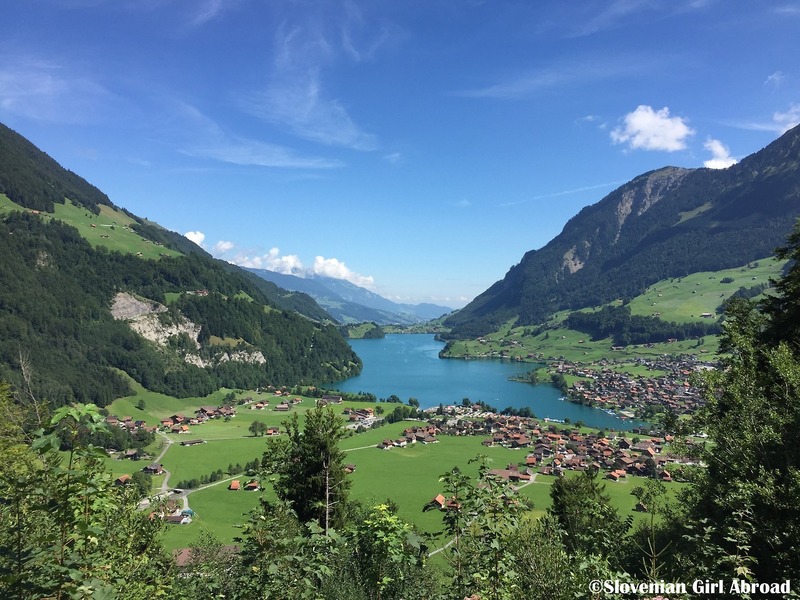 According to the traffic news on radio was the road between Lauterbrunnen and Interlaken closed for all traffic until further notice. We didn’t want to wait in the traffic jam, so we stopped by the Trummelbach Falls. Unfortunately, we were too late to visit. The access to the waterfalls was already closed. Instead of exploring waterfalls, we stopped for a drink at the restaurant by the entrance. After drinks at the restaurant, we returned back to our car. The road was supposedly already open, but the traffic jam was still there. After moving with the snail-pace for app. 40 minutes, we’ve reached the place where we were able to park our car. 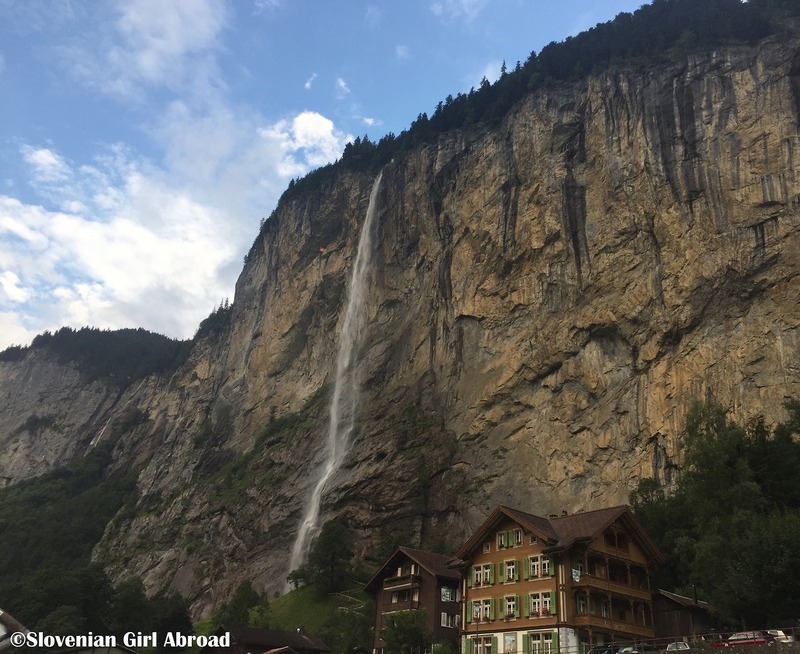 We left it there and stroll through the streets of Lauterbrunnen to the Staubbach Falls. With its height of 300 meters is Staubbach waterfall the third highest waterfall in Switzerland. During summer months you can walk to the rock balcony carved into the rock under the waterfall. We hiked this path and definitely got the idea where this waterfall got its name. The dropping water sprayed and swirled in all direction as the dust (Staub = dust). 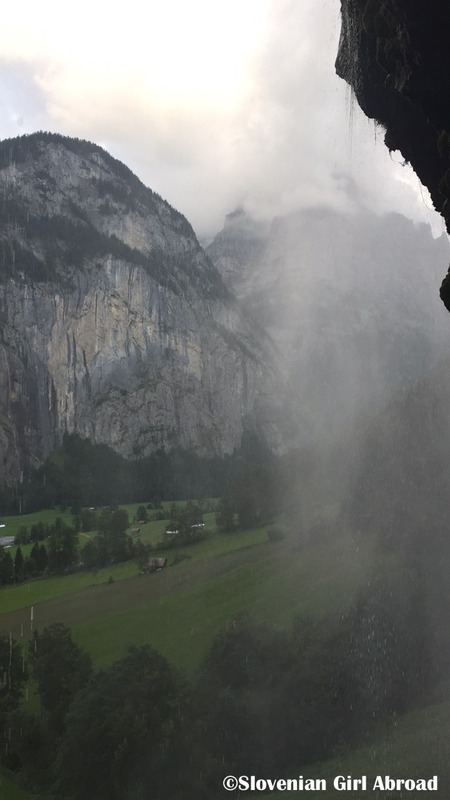 By the time we returned back from the waterfalls, the road finally cleared and we were able to finally leave Lauterbrunnen valley. Tired, but happy for the great day we’ve spent together, we returned back home to Lucerne. 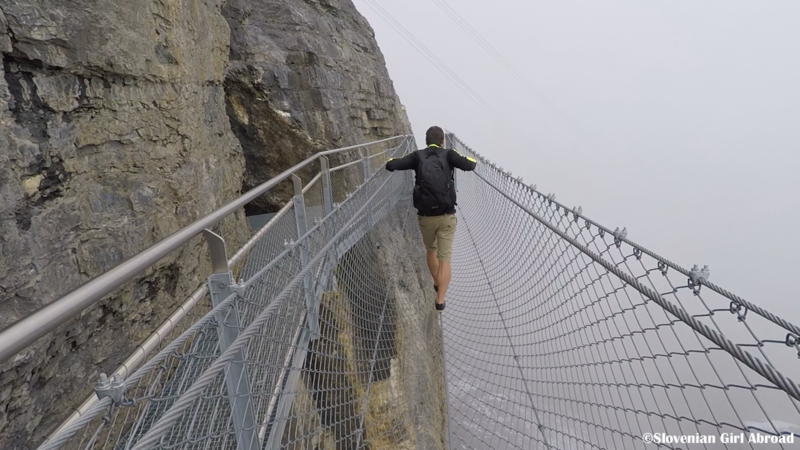 I love those incredible Alpine views, the cheesy Swiss cuisine, and oh my goodness, that thrill walk! I wonder if I’d do it …? We leave this Sunday for Switzerland. We’re so excited to see the Alps! Any recommendations for authentic Swiss food in Zurich, Chur, Lucerne, Grindelwald, or Basel at an affordable price? Already? Time really flies. 🙂 Uff, dining in restaurants for affordable price might be tricky. Be prepared for high Swiss prices. For rösti, I can definitely recommend restaurant of the Hotel Alpenruh in Mürren where we’ve ate on the trip I’ve wrote about. 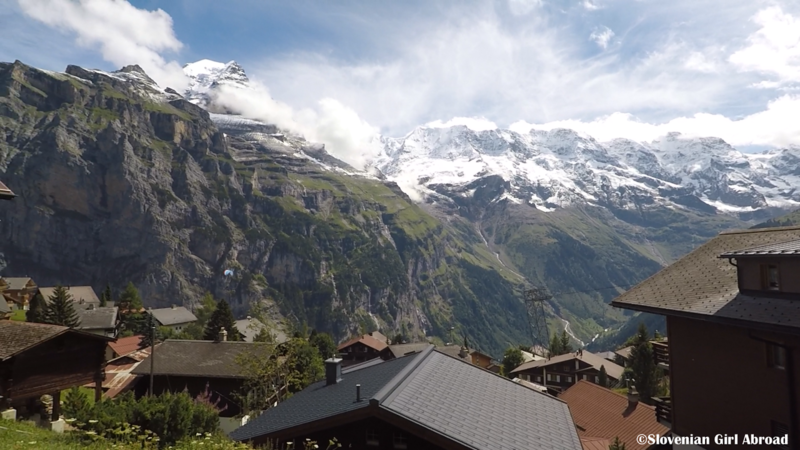 If you’re going up to the mountains above Grindelwald, go and dine at the mountain cottages/restaurants there. We usually eat there when skiing and food was almost always good. I don’t have many experiences with Swiss food in Zürich, Chur, Lucerne and Basel. A friend suggested Zeughauskeller in Zürich and Old Swiss House in Lucerne (close to the Lion Monument), but I haven’t been there yet. 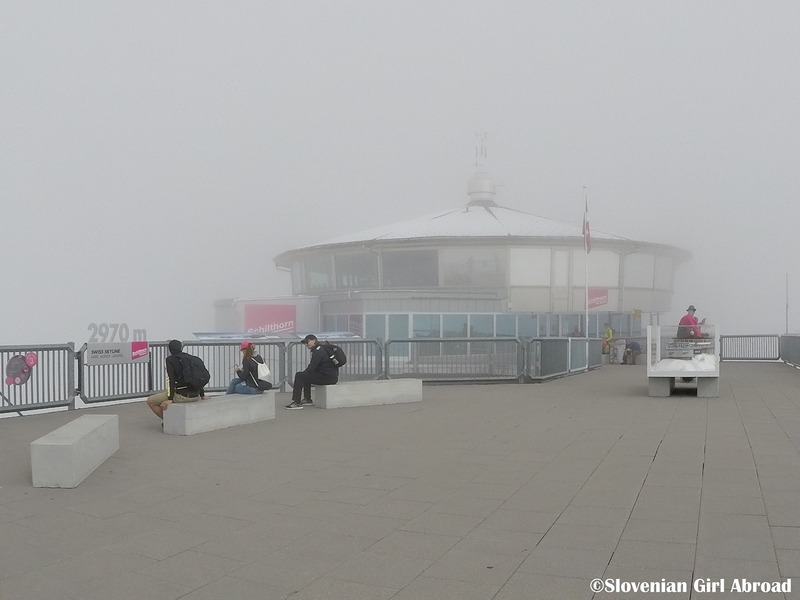 If you’re going up to Rigi, I would suggest trying apple strudel with vanilla sauce in the restaurant at Rigi Kulm. Thanks so much, Urska, for your kind offer. We hope to have time for a tour on Lake Lucerne. How do we connect for that? My favorite area of Switzerland! Really awesome, Switzerland is just beautiful (wincingly expensive mind!). Loved your foggy shot! Wilbur. It looks really pretty. I am from a country without any hills or mountains, so I am always completely stunned by giant mountains! Thank you Katy. No editing was used on this photo – this place really looks that amazing. 🙂 Always a pleasure joining #FarawayFiles. now heres a spot id like to visit! How these sort of places get built in such precarious positions I have no idea! Switzerland is such I beautiful country. We have not visited these places but the look amazing. 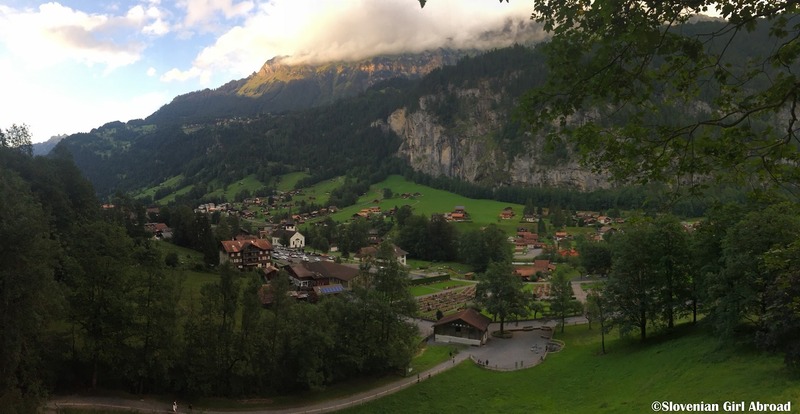 I would love to return again to Switzerland to check out Lauterbrunnen . Great photos and thanks for sharing Urska. So pretty! The second photo looks like something out of a picture book – it’s perfect! The thrill walk looks like a lot of fun for an adventure lover too. No photoshop was used – it really is so spectacular. 😉 Thank you! Sounds like a really exciting day! I would not dare to do the thrill walk, though – it looks SO scary!! Such beautiful photos. And I love the meaning of Staubbach Falls. As with all of your adventures this one looks stunningly beautiful. 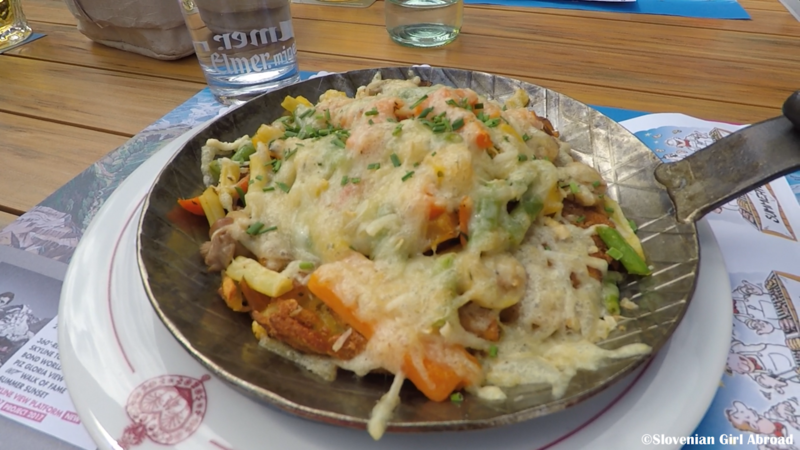 Shame you had a bit of cloud cover in places but the rosti looks like it made up for it. Thanks for joining us on #adventurecalling I hope you can again tomorrow. I don’t know what to say. Switzerland is absolutely spectacular. The only place in America that is somewhat comparable would be the North Cascades in Washington state. But I think that Switzerland is even more amazing. Thank you so much for sharing such wonderful photos and a great narrative of the trip. Wonderful story and photos, Urska! Thank you for sharing. Your English is coming along well. Congrats. Slovenia and Switzerland are among the most peaceful and beautiful places in the world I have visited. Did you move to Luzern for university or to teach or something else? You’re English is really quite good, actually, Urska. Congrats on the marriage. Love wins! What do you like to do when you are not traveling or writing? Where are you planning to go next? Thank you Lane! You know, all the usual stuff of everyday life. 😉 We’re going back home to Slovenia for Christmas holidays. Then we’re planning a ski trip in January and trip somewhere overseas in April/May. Destinations for those two are to be determined. Any suggestions? Austria has amazing skiing. That is where I learned to ski as a child, but cold weather destinations aren’t really my thing any more. Sunny San Diego has spoilt me. I still want to explore more of the Balkans… maybe Montenegro, Albania Romania and or Bulgaria. Have you been to any of those places? Lucky you. My friends live in California and are only telling good things about climate there. I was in Bulgaria many years ago. You’ll definitely have to come to San Diego! And when you do, reach out and we’ll show you around It was 72F yesterday! !… in December! 🙂 How is the tourism infrastructure in Bulgaria? I’m a bit adventurous, but concerned it might be outside my girlfriends’ comfort zone right now. So warm? Heaven! Here in Switzerland is currently 5C max. With the ice-cold rain we had in past few days it is really depressing. I was in Bulgaria in 2004, so the things probably changed a bit. We were at this seaside resort-town close to Varna with plenty of hotels, restaurants and shops. The infrastructure there was good. How was/is in other places, I don’t know. I used to live in Iceland, so I know cold winters, but since being spoilt in San Diego I start to complain when it drops below 70F. I loved Iceland. It was cold, but the landscapes are amazing.